Face.com, the service that uses facial recognition to auto-tag your Facebook photos, is expanding across the web today with the launch of an API. Developers can now tap into Face.com’s technology to add facial recognition to all kinds of web apps for free via the open API. The company claims that its technology can identify faces even in poor lighting or poor focus; or when subjects are wearing glasses, facial hair, and supposedly even Halloween costumes. By way of demonstration, Face.com has provided three sites using the API for developers to try. 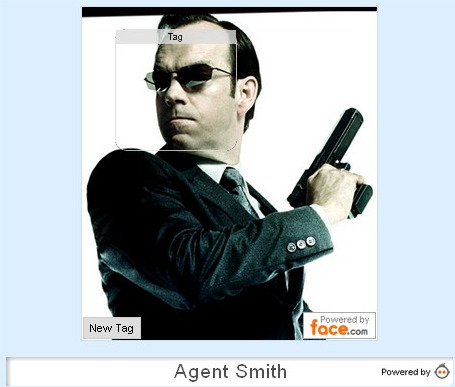 CelebrityFindr uses facial recognition to find celebrity photos on Twitter. It seems quite effective, if skewed towards American celebrities. The facial recognition certainly seems to act as good filter for removing tweets that mention celebrities but don’t actually feature them in linked photos. The Tagger Widget can be embedded in any webpage to auto-tag photographs, while Poster Yourself adds Facebook photos to celebrity images. While there are already a few ‘face in hole’ sites out there, this demo does a great job at choosing photos that best fit the poster. For example, here I am as Darth Vader. Face.com could be onto something with this API. We couldn’t find any other currently available free, open facial recognition APIs out there. The company’s technology was recently used in an impressive social Augmented Reality app so we look forward to seeing what other developers do with it.